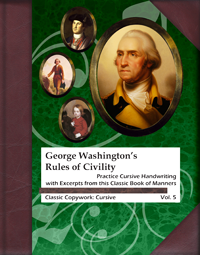 Immerse yourself in history and improve your social graces while practicing your cursive handwriting. Copywork is the best way to learn basic grammar, spelling, and composition skills, so why practice penmanship with random phrases and sentences when you could be learning from one of history's great leaders in his own words? In addition to being a renowned general and the first President of the United States, George Washington was noted for his impeccable manners. At the age of 14, he wrote a book called Rules of Civility and Decent Behavior in Company and Conversation, which drew from a French book of maxims intended to cultivate virtue, ease social relations, and improve self-control. This copybook includes over 30 passages. Buy online directly or from Amazon. Download a free sample of one of this book's passages here. Speset (pronounced spehs-eht) is fundamentally founded on helping people. It's designed to help homeschoolers find resources and learning opportunities, and it's designed to help public and private schoolers follow their interests outside the system and learn in ways suited to them. It's designed to assist education and congregation. It's designed not just to educate but to inspire. That's why we chose the name Speset, a contraction of two Latin words together meaning "Life, and..." "Spes" has the additional meaning of "hope". So the goal of Speset is life, and whatever you choose to do with it.